FEB 09 (WTN) – In the Madhya Pradesh BJP, the revolt has begun. As you know, before the Assembly elections, former Union Minister Sartaj Singh had rebelled from the party and contested on the ticket of Congress. Whereas during the assembly elections, in discussion of not getting ticket to himself or his daughter-in-law, former Chief Minister Babulal Gaur also threatened to rebel from the party. Although his daughter-in-law got the ticket in the assembly elections, then the rebellion nature of Gaur suddenly reduced. Apart from Sartaj Singh and Babulal Gaur, several other senior leaders of BJP have also got into the revolt against the party. As you know, former MP and senior BJP leader Ramkrishna Kusmariya has left the BJP yesterday and joined the Congress in presence of Rahul Gandhi. Kasumariya was accusing quite a lot of times that senior leaders are not being valued in the BJP. For your information, let you know that Kusmaria was not given the ticket in the assembly elections this time, after which he had contested as independent candidate from Damoh and Patharia seat, but he had to face defeat. It is said that since then Kusmariya was angry with the BJP leadership. A few days ago, Kusmariya had met Babulal Gaur, after which speculation was being made that Ramkrishna Kusmaria could take any major step. 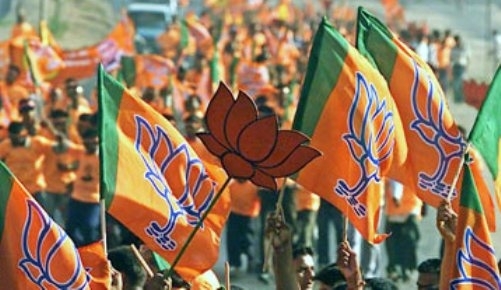 The BJP claims that joining the Congress of Kusmariya will not be harmful for the party, but the BJP leadership has probably forgotten that one of the reasons of the defeat of the former finance minister Jayant Malaiya in Damoh constituency in the assembly elections was the contesting of Kusmariya as independent candidate. For your information, let you know that Ramkrishna Kusmaria has given a letter to Rahul Gandhi while joining the Congress party. It is said that this letter has remained the subject of discussion in the political corridors. The BJP leaders are worried that the letter of Kusmaria can create a touble for the BJP. Meanwhile, Kusum Singh Mehdele, who was the minister in Shivraj Government, has also expressed resentment with the BJP. For your information, let you know that in the assembly elections, the BJP did not give ticket to Kusum Singh Mehdele, after which she is said to be upset to the party. Angry with the party, Kusum Singh Mehdele, while targeting the BJP leadership, said that the party should not ignore the senior leaders but respect them. One can say this is Mehdele's resentment or threatening, but she has demanded from the party that either she should be given ticket for Lok Sabhe election from Damoh or Khajuraho constituency or else should be appointed the governor. Sartaj Singh was separated from the BJP before and now Ramkrishna Kusmariya has taken over the Congress, then after the Babulal Gaur, there are signs of rebellion in the statements of Kusum Singh Mehdele. Political analysts say that this kind of rhetoric is said pressure politics and at the time of elections, such pressure politics is being held in almost every party. At the same time, the experts say that except Sartaj Singh, detaching from the party of leaders like Ramkrishna Kusmariya will not make any difference in the BJP. Well, experts can say anything, but it is true that the detaching of senior party leaders from the party as well as the insurgency voice of senior leaders are not right from the point of view of the Lok Sabha elections for the BJP. It is true that the party is bigger than any leader, but the party is made up of the mass leaders. The BJP needs to be alert because the senior leaders’ insurgency may become the cause of defeat for the party. Why Rahul Gandhi behaves like immature person in politics? The campaigning for the Lok Sabha elections continues on social media! Know the 4G download and upload speed of the mobile network companies? Know by which policy of the Modi Government Pakistan screwed up? Sri Lanka pays heavy loss by ignoring the Indian intelligence information about the blasts in Colombo! Is something going to be 'very big' in this Lok Sabha elections in the West Bengal? After purchasing from the store, say 'No' on the demand for the Carry Bags charge! Tik Tok takes a 'big decision' after the ban in India!